It seems like everywhere you go these days, or every time you turn on the TV, there’s a story about pro-poker players raking in huge amounts of cash. Some, though, bring in a lot more than others. The elite players always give us mere mortals something to aspire to with our own poker play. 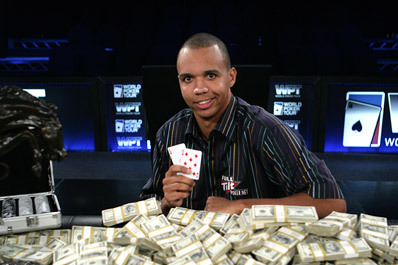 We are proud to present a few of the top poker players of 2011. 1. Matt Giannetti: One of the younger players on our list, Matt Giannetti hails from Las Vegas. He received his education at the University of Texas but soon after graduation, found his true calling with high stakes online poker. Giannetti, who also enjoys playing poker live on TV, joined the WSOP in 2011 at third position. His winnings there make him one of the top poker players for 2011, and brought his earnings to an impressive grand total of$ 3,683,286. 2. Galen Hall: Also young and cocky, Galen Hall a San Francisco native, was accepted to Stanford University’s MBA program in 2011. It almost seems unfair to make this poker star prove his business capabilities by pursuing a degree. He’s already proven what a great strategizer he is time and time again, a fact that’s obvious if you look at his poker history. Hall earned over a million dollars gambling online as a mere undergraduate. Although he didn’t have a lot of luck in the live world of poker at first, he eventually made good at the 2011 PokerStars Caribbean Adventure and then at subsequent events. His winnings have brought him to an impressive earning of $3,521,069 this year alone. 3. Elio Fox: Our next of the top poker players of 2011 is Elio Fox. This native of New York has quirky good looks that attract attention. However, he tends to remain pretty tight lipped about his personal life so not a lot of extra information is known about him. Who needs to talk though when they’ve earned a whopping $2,900,846. 4. Eugene Katchalov: This top poker player’s name is a little hard to say and that’s because he’s the first non-American on our list. Katchalov was born in the Ukraine, though he did spend most of his youth in New York, even going on to graduate from New York University with a degree in business. In college, he also found the game of poker, which he would eventually choose over business prospects. To date, that smart choice has earned him $7,004,161. 5. Chris Moorman: Another non-American finishes off our list. From the United Kingdom, Chris Moorman is a sweet and very private young man. Don’t let his innocent looks fool you, however. He can be a bit of a poker shark, and earned $2,524,028 this year.